OXFORD® PARTIAL KNEE: THE ONLY ONE OF ITS KIND. Is a partial knee right for you? Only your doctor can say for sure. But we can tell you this. Knee osteoarthritis sometimes only occurs on the medial side of the joint (the side closest to your other knee). In knees that are otherwise healthy, partial knee replacement can preserve the healthy bone, cartilage and ligaments. In a healthy knee, the meniscus serves as a shock absorber between the ends of the bones. The Oxford Partial Knee is the first partial implant with an artificial meniscal bearing designed to glide freely throughout the knee's range of motion, more closely replicating normal movement. The free-floating nature of the device potentially provides for a more natural motion. 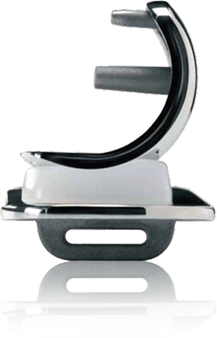 The Oxford Partial Knee is the most widely used and clinically proven partial knee in the world. Published long-term clinical results on the Oxford® Partial Knee demonstrated a 92.4% survivorship at 10 years,*8-14 94.0% at 15 years,*11,13-14 and 91% at 20 years,*11 proving The Oxford® Partial Knee the most widely used and clinically proven partial knee in the world. Not all patients are candidates for Oxford Partial Knee replacement. You should discuss your condition and treatment options with your surgeon. Zimmer Biomet offers the broadest range of partial knee replacements available, providing your surgeon with unparalleled flexibility to address your condition. All provide the option of minimally invasive surgery. ** Adjusted odds ratio-controlled for gender, age, minority, income, and center. The multi-center study was led by researchers at Washington University in St. Louis, Missouri. Patients included in the study were treated with either total knee replacement, fixed-bearing unicompartmental knee replacement, or the Oxford®Partial Knee. Centers contributing data on both total knee and partial knee replacement were Washington University, St. Louis, Missouri; Rush University Medical Center, Chicago, Illinois; and Mt. Carmel Hospital, New Albany, Ohio. Data for the study were gathered through comprehensive interviews, conducted by the University of Wisconsin, of 1,263 consecutively identified arthroplasty patients who met the inclusion/exclusion criteria. This is a Zimmer Biomet-funded study and the data is on file.